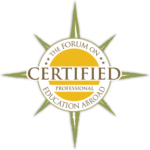 Forum’s Standards provide a means to assess and ensure quality in all areas of education abroad programming – academic programming, student conduct, resources and personnel and policies and procedures. Using the Standards as a guide, participants will examine practices at their universities or organizations. This workshop will be highly interactive, drawing on case studies and issues of interest to participants. 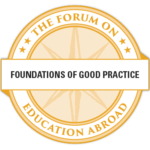 This qualifies as a Forum Certification Workshop and part of the Foundations of Good Practice in Education Abroad Competency. This workshop is associated with the Foundations of Good Practice in Education Abroad Competency Credential and Module 1 of the Professional Certification in Education Abroad Program.